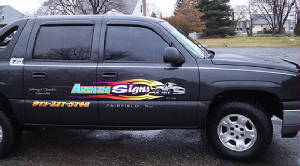 Welcome to Artistic Signs, Graphics & Full Color Printing! We have been producing High Quality Signage and Graphics for Over 30 Years! Our commitment to high quality design and execution have vaulted us to the top of the sign industry. Our years of experience, reputation, and recognition have instilled great confidence in our clients and hopefully future ones. We try to explain to our customers that " Image is your First Impression "
From custom lettering, signage and decals to creative stripe kits. We try to meet and exceed every design we create each time. We can also design and personalize items to fit your needs. Let me take the time and say we try to treat each job as important as the next. Sometimes the demand grows so large that we may need to take a few more days to produce your job. We Do Not like to rush our work! It is a reflection upon us and our standards. Alot of our items are made to order and Not just sitting on a shelf or in a box. This way you receive New items freshly designed and mastered each time. We want everyone to feel comfortable with us and know that we take pride in what we do. Please take some time and take a glance at what we have to offer you.